By immunoelectrophoresis and ELISA this antibody reacts specifically with mouse IgG and with light chains common to other mouse immunoglobulins. No antibody was detected against non-immunoglobulin serum proteins. Reduced cross-reactivity to bovine, chicken, horse, human, pig, rabbit and rat IgG was detected. 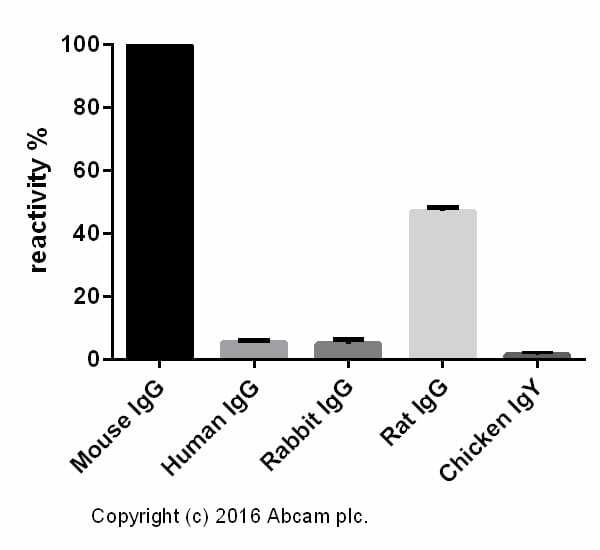 This antibody may cross react with IgG from other species. Antiserum was cross adsorbed using bovine, chicken, horse, human, pig, rabbit and rat immunosorbents to remove cross reactive antibodies. This antibody was isolated by affinity chromatography using antigen coupled to agarose beads. Our Abpromise guarantee covers the use of ab150117 in the following tested applications. ab7751 staining beta III Tubulin in Neuro-2a cells. The cells were fixed with 100% methanol (5min) and then blocked in 1% BSA/10% normal goat serum/0.3M glycine in 0.1%PBS-Tween for 1h. The cells were then incubated with ab7751 at 1/1000 and ab6046 at 1µg/ml overnight at +4°C, followed by a further incubation at room temperature for 1h with an AlexaFluor®488 Goat anti-Mouse secondary (ab150117) at 2 µg/ml (shown in green) and AlexaFluor®594 Goat anti-Rabbit secondary (ab150088) at 2 µg/ml (shown in pseudo color red). Nuclear DNA was labelled in blue with DAPI. Negative controls: 1, Rabbit primary and anti-mouse secondary antibody; 2 , Mouse primary antibody and anti-rabbit secondary antibody. Controls 1 and 2 indicate that there is no unspecific reaction between primary and secondary antibodies used. ab7291 staining alpha-Tubulin in NIH3T3 cells. The cells were fixed with 100% methanol (5min) and then blocked in 1% BSA/10% normal goat serum/0.3M glycine in 0.1%PBS-Tween for 1h. The cells were then incubated with ab7291 at 1µl/ml and ab6046 at 1µg/ml overnight at +4°C, followed by a further incubation at room temperature for 1h with an anti-mouse AlexaFluor® 488 (ab150117) at 2 µg/ml (shown in green) and anti-rabbit AlexaFluor® 594 (ab150088) at 2 µg/ml (shown in pseudo color red). Nuclear DNA was labelled in blue with DAPI. Negative controls: 1, Rabbit primary antibody and anti-mouse secondary antibody; 2 , Mouse primary antibody and anti-rabbit secondary antibody. Controls 1 and 2 indicate that there is no unspecific reaction between primary and secondary antibodies used. ab7291 staining alpha-Tubulin in Caco-2 cells. The cells were fixed with 100% methanol (5min) and then blocked in 1% BSA/10% normal goat serum/0.3M glycine in 0.1%PBS-Tween for 1h. The cells were then incubated with ab7291 at 1µg/ml and ab6046 at 1µg/ml overnight at +4°C, followed by a further incubation at room temperature for 1h with an anti-mouse AlexaFluor® 488 (ab150117) at 2 µg/ml (shown in green) and anti-rabbit AlexaFluor® 594 (ab150088) at 2 µg/ml (shown in pseudo color red). Nuclear DNA was labelled in blue with DAPI. ab7291 staining alpha-Tubulin in SV40LT-SMC cells. The cells were fixed with 4% formaldehyde (10 min), permeabilized in 0.1% Triton X-100 for 5 minutes and then blocked in 1% BSA/10% normal goat serum/0.3M glycine in 0.1% PBS-Tween for 1h. The cells were then incubated with ab7291 at a working concentration of 0.5µg/ml and ab190573, Rabbit monoclonal [EP1332Y] to alpha Tubulin (Alexa Fluor® 647, shown in red) at 1/250 overnight at +4°C, followed by a further incubation at room temperature for 1h with an anti-mouse AlexaFluor® 488 (ab150117) at 2 µg/ml (shown in green). Nuclear DNA was labelled in blue with DAPI. The cells were fixed with 100% methanol (5 minutes) and then blocked in 1% BSA/10% normal goat serum/0.3M glycine in 0.1%PBS-Tween for 1 hour. The cells were then incubated with ab8245 at 5 µg/ml and ab6046 at 1 µg/ml overnight at +4°C, followed by a further incubation at room temperature for 1 hour with Goat Anti-Mouse IgG H&L (Alexa Fluor® 488) preadsorbed (ab150117) at 2 µg/ml (shown in green) and Goat Anti-Rabbit IgG H&L (Alexa Fluor® 594) preadsorbed (ab150088) at 2 µg/ml (shown in pseudo color red). Nuclear DNA was labeled in blue with DAPI. The cells were fixed with 4% formaldehyde (10 minutes) and then blocked in 1% BSA/10% normal goat serum/0.3M glycine in 0.1%PBS-Tween for 1 hour. 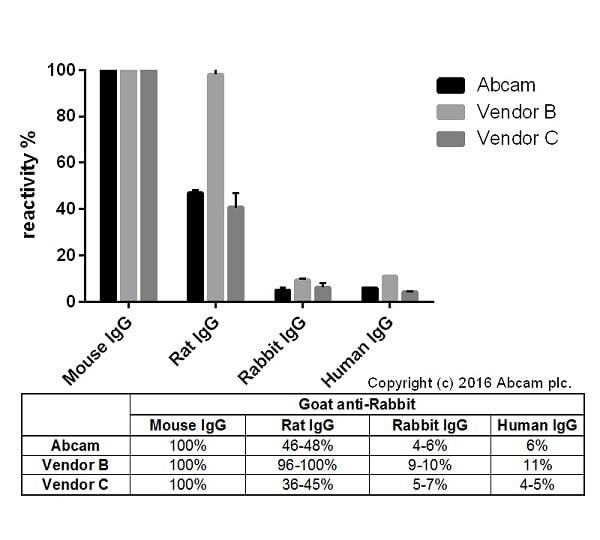 The cells were then incubated with ab8245 at 1 µg/ml and ab202272 at 1/250 overnight at +4°C, followed by a further incubation at room temperature for 1 hour with Goat Anti-Mouse IgG H&L (Alexa Fluor® 488) preadsorbed (ab150117) (shown in green). Nuclear DNA was labeled in blue with DAPI. The cells were fixed with 4% formaldehyde (10 minutes), permeabilized with 0.1% Triton X-100 for 5 minutes and then blocked in 1% BSA/10% normal goat serum/0.3M glycine in 0.1%PBS-Tween for 1 hour. The cells were then incubated with ab8245 at 5µg/ml and ab202272 at 1/250 overnight at +4°C, followed by a further incubation at room temperature for 1h with Goat Anti-Mouse IgG H&L (Alexa Fluor® 488) preadsorbed (ab150117) (shown in green). Nuclear DNA was labeled in blue with DAPI. ICC/IF image of ab7291 stained HeLa cells. The cells were 100% methanol fixed (5 min) and then incubated in 1%BSA / 10% normal goat serum / 0.3M glycine in 0.1% PBS-Tween for 1h to permeabilise the cells and block non-specific protein-protein interactions. The cells were then incubated with the antibody (ab7291, 10µg/ml) overnight at +4°C. 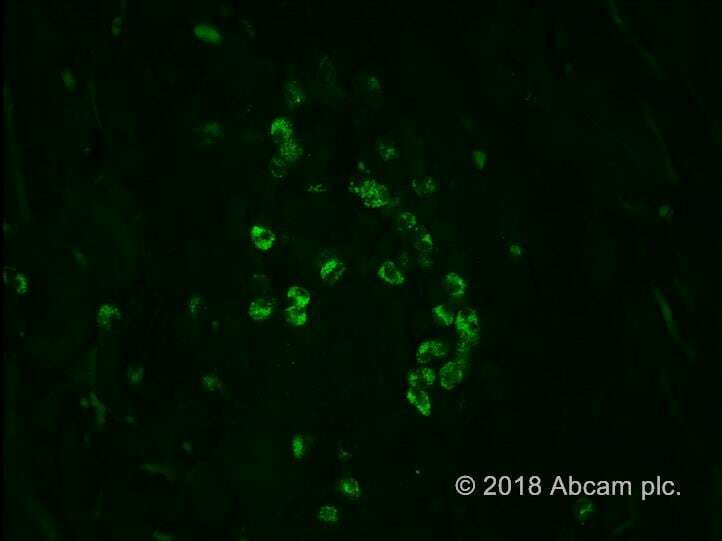 The secondary antibody (green) was ab150117 Alexa Fluor® 488 goat anti-mouse IgG (H+L) used at 1µg/ml for 1h. DAPI was used to stain the cell nuclei (blue) at a concentration of 1.43µM. Immunocytochemistry/ Immunofluorescence - Goat Anti-Mouse IgG H&L (Alexa Fluor® 488) preadsorbed (ab150117)This image is courtesy of an Abreview submitted by Kirk McManus. ab134375 staining CD24 in human HeLa cells by ICC/IF (Immunocytochemistry/immunofluorescence). Cells were fixed with paraformaldehyde. Samples were incubated with primary antibody (1/200 in PBS) for 1 hour at 22°C. An Alexa Fluor® 488-conjugated goat anti-mouse IgG H&L (ab150117) (1/200) was used as the secondary antibody. Following 4% PFA fixation, cells from the ventral mesencephalon were incubated with an anti-GFAP (Non-Abcam) antibody O/N @ RT. ab150117 (1:500) was applied for 2 hours @ RT to visualise astrocytes. We use this antibody together with the antibody 19905 (EPX) in eosinophilic skin. As working concentration we used a 1/100 Dilution for 30 minutes at room temperature. Adult rabbit testes were fixed with 4% paraformaldehyde. Tissue was embedded in O.C.T. and frozen. 5 micron sections were cut and transferred to slides. Sections were permeabilized with 0.1% Triton X-100 in PBS, and blocked with 3% BSA in 0.1% Triton X-100 + PBS. Sections were incubated with either (A) no primary antibody or (B ) anti-DDX4 (Abcam ab27591) for 1 h at RT. Sections were then washed 3X with 0.1% Triton X-100 in PBS and Goat-Anti Rabbit 488 (Abcam ab150117) applied at a 1:500 dilution. Sections were then mounted after washing 3X with 0.1% Triton X-100 in PBS. This antibody has been used extensively with a number of different primary antibodies generated in rabbits. It performs extremely well at a 1:200 dilution. Attached is an immunofluorescent image of paraformaldehyde-fixed HeLa cells that were immunofluorescently labeled with a cell membrane-specific antibody (ab134375). The secondary antibody has been pseudo-colored green in the merged image. DNA was counterstained with DAPI. Alpha smooth muscle Actin expression in spontaneously differentiated human iPS cells. 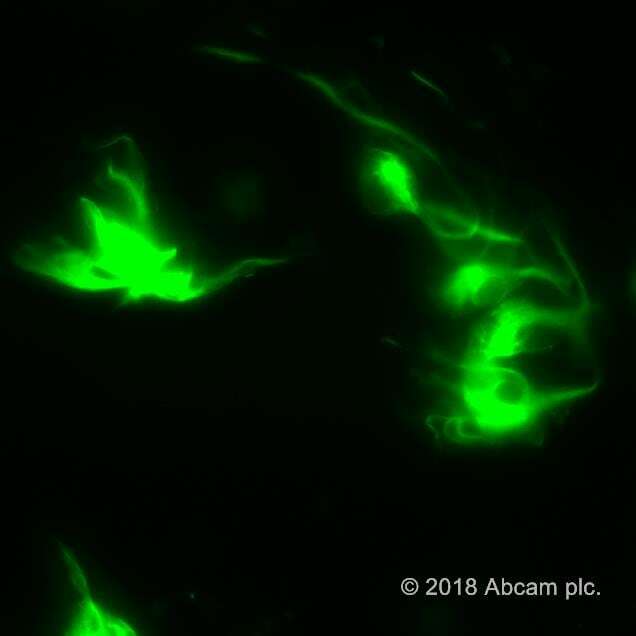 Following fixation in 4% PFA, the cells were assessed for alpha smooth muscle Actin using 1:100 dilution of the primary antibody (ab7817) in 1% serum, 0.1% triton, 0.1% BSA in PBS, followed by detection using goat polyclonal mouse IgG Alexa 488 (ab150117) at 1:500. 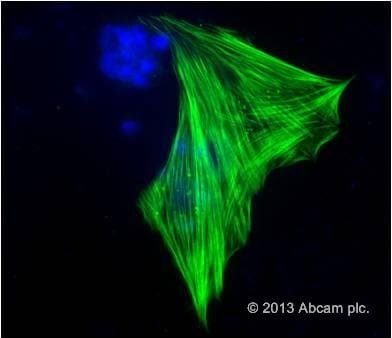 The results show clear alpha smooth muscle Actin fibres (green). An isotype control IgG was run in parallel and showed no positive staining (not shown here). Nuclei were counterstained using DAPI (blue).